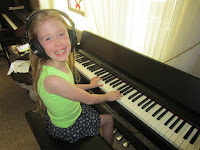 AZ PIANO REVIEWS: REVIEW - Why Should Kids Play Piano? READ THIS! REVIEW - Why Should Kids Play Piano? READ THIS! 🎹 UPDATED - July 10, 2018 - Kids Should Play Piano and take Piano Lessons! Why should kids (or anyone at any age) play music, especially on the piano? Playing good music in my opinion is the ultimate live expression of one's inner soul and can be one of the most beautiful experiences a person can have! When a parent is considering getting their kids into music and having them play a musical instrument, especially a piano, the results can be most impressive and satisfying when your child is given strong, supportive parental support and they get a good music teacher and lesson program. Playing the piano as opposed to other instruments allows a person to play melody and harmony accompaniment which then allows for the playing of the entire song by one person so that nothing is left out of the song. 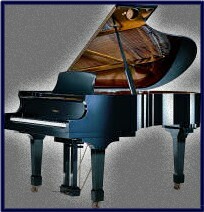 Most other instruments allow for only separate melody, harmony, or bass...but not all at once like on a piano. Instruments that are more limited in that way are horns, woodwinds, percussion, many stringed instruments, and so on. Some people can play other instruments like guitar, harp, organ, harpsichord, etc and get all parts of the music like you can on the piano. But the piano is, in my opinion, by far the most expressive and musically full instrument a person can learn to play, and even a young child by age 3 or 4 can do it with the right instruction and input. The piano is also the easiest musical instrument to get music out of quickly...relative to other instruments and it is a great instrument to learn about music theory, music fundamentals, and musical technique. Whether or not your child ever plays like a professional (such as in the videos below), is not the point. The point is to give them the opportunity and to encourage them to do their best because at the end of the day, it's up to parents to provide the support, encouragement, and patience to see their children's lives changed in ways they never thought possible, and to bring joy to them through a personal connection with playing music. If you, as the parent, have never had the opportunity to personally connect with playing music yourself, then please do not withhold the opportunity from your children just because you did not have or want that same opportunity. Don't leave it up to your children or their school teachers to decide for them so take the initiative and get your kids involved. Yes there is a cost to it in both money & time, but it is a gift you can give that can pay back in huge ways until the day you and your kids are no longer here. 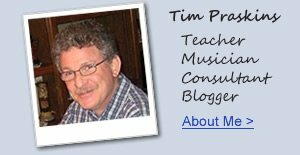 I should know because not only am I a professional piano, guitar, and organ teacher, but I also have 4 children all of whom can play piano and two of them are piano teachers themselves. 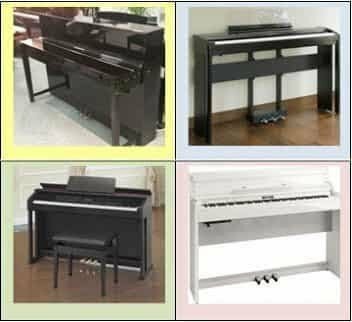 So when it comes to music, piano, and experience with pianos all all sizes, shapes, and types, I am an expert and can help you and your family make the right piano purchase decision. 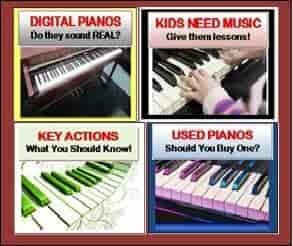 When you do make that decision, be sure you purchase an instrument & get a piano teacher that will help take your kids to a skill level where they can produce great music. One of those very cool digital pianos right now is the Casio Privia PX870 (left pic). 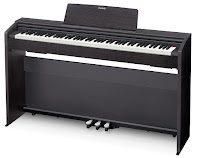 Go to the following link to read a full review of this new piano which sells on the internet for a discount price of just $999US. 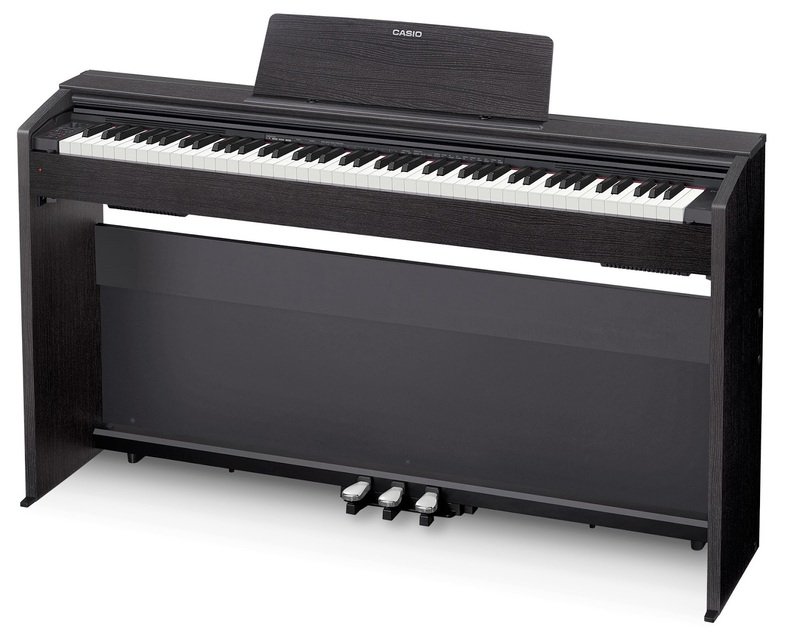 Another piano which is very popular is the Kawai KDP90 ($1149US internet discount price) which I have reviewed on this blog. Whether your children play for fun, entertaining for an audience, or they play for you, playing piano is something that will be an amazing experience no matter what their skill level and musical accomplishments may be. 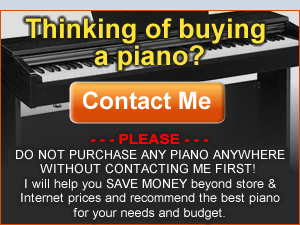 Be sure you contact me directly and I will give you the advice you need to make the best decision on which piano to purchase based on your family's budget and musical goals and also what to look for when searching for a good piano teacher. Another thing that is really motivating children to get involved with playing and learning piano is the ability to connect an iPad to many of the new digital pianos. There are a number of very exciting and motivating piano/music learning apps for young children on up to adults. The interactive iPad experience utilizing a variety of ways to get people involved at home in learning music are quite useful and intuitive. In some cases even as a beginner using iPad piano/music apps, you (a child or adult) can learn more about piano note reading, music understanding, and rhythm training in 1 month than many people in the past have learned in one year! 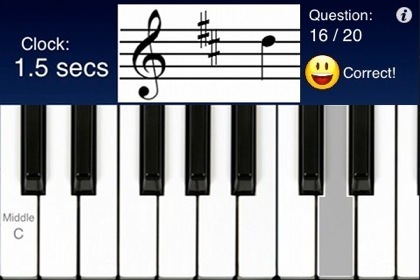 I personally use these iPad piano/music learning apps in my teaching studio such as the Joy Tunes "Piano Maestro" or "Simply Piano" and they really add a lot to the normal curriculum if used correctly. Below are some awesome videos of people that I know of who took their music seriously enough to achieve a very high skill level. They are performing now for audiences all over the world and the music lessons and playing opportunity their parents gave them is what started it all. You can do this same thing for your kids (and yourself) too although they don't have to become a famous musician but anything is possible:) Don't just think about it for your kids... do it because it could just be the most important gift you will ever give to them and they will forever thank you! 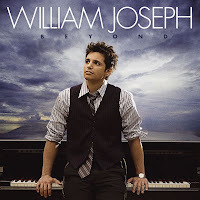 One of the musicians in these videos below is William Joseph who is a personal friend of mine. I have known William for many years and have worked with him professionally. He plays and writes his own music as well as plays other composer's music and does big concerts all around the world and was discovered by the famous music producer David Foster. 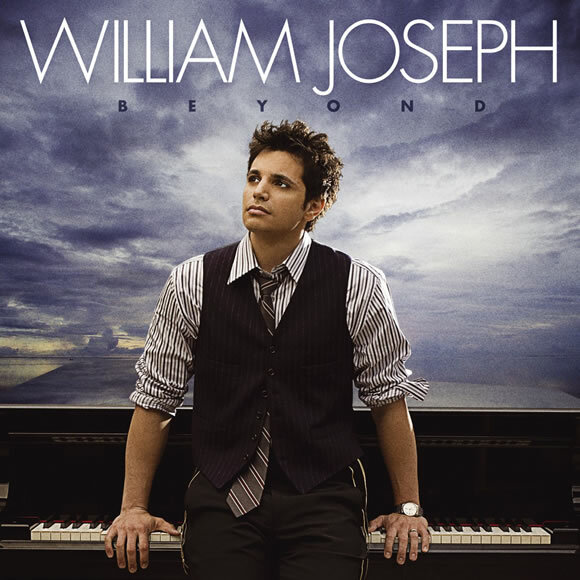 William is an amazing pianist and you should definitely listen to him in the video below. The other musicians in the videos are called "The Piano Guys." They use acoustic and digital instruments to create a blend of music that is contemporary but traditional at the same time. Much of the technology The Piano Guys use is music equipment I am familiar with and have used myself. 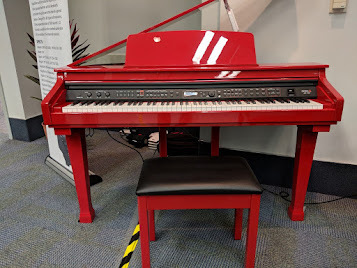 When it comes to music technology, this is the kind of thing that kids of all ages just love and it gets them motivated to play and perform music when they otherwise might think playing piano can be boring. When you can learn, play, & create in new and exciting ways, then music is likely not going to be boring and becomes even more exciting for both the player and the audience! When I heard a new music concert in favorite festival. Playing Keyboard was center connected with concert to catch the attention of audience. Pianist explained to, all credits intended for best midi keyboard.